With presidential runs by both Mitt Romney and Jon Huntsman underway, both of whom are members of the Church of Jesus Christ of Latter-day Saints, it seems appropriate to reflect on the 1844 run for president of Joseph Smith Jr, the founding prophet of the Church of Jesus Christ of Latter-day Saints. Smith’s third party/non-party campaign was underway when he was assassinated on June 27, 1844. The opposition that Romney and Huntsman face in the Republican Party primary process, and perhaps among the larger electorate, about their Mormonism are deep seated in American history and culture and are illuminated in the unsuccessful presidential run of Joseph Smith in 1844. My friend Adam Christing has produced an excellent documentary on this political campaign, and information about it is available here. Christing has made an important connection between 1844 and the present political season by noting: “The two things you aren’t supposed to talk about in this country are religion and politics. But that’s the explosive combo that makes this such a fascinating subject.” Let me offer here a brief discussion of some of the issues connecting Joseph Smith and both Mitt Romney and Jon Huntsman in this blog post. Smith’s Views revealed him as more than a one-issue candidate. For the reform of government, he intended to reduce the size and salary of Congress. In judicial reform, he advocated rehabilitation of convicts through work projects and vocational training and liberal pardoning. In economic reform, he proposed less taxation, free trade, secure international rights on the high seas, and establishment of a national bank in every state and territory. On the slavery question, he advocated compensated emancipation through the sale of public lands. To cope with resulting social stress, he advocated the relocation of the several million freed slaves to Texas. In keeping with the spirit of “Manifest Destiny” in the 1840s, he proposed annexation of Oregon and Texas and whatever parts of Canada wished to join the Union. 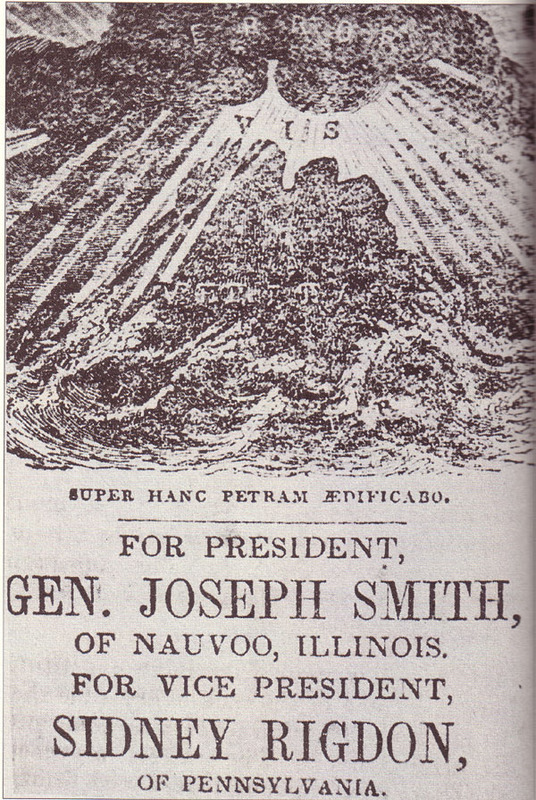 As a reflection of the Mormon expulsion from Missouri, Smith’s platform also advocated presidential intervention in civil disturbances within states. As one author noted, this interventionist impulse ‘did not exist until the Civil War and Reconstruction.’ (D. Michael Quinn, The Mormon Hierarchy: Origins of Power (Salt Lake City, UT: Signature Books, 1994), p. 119). The positions stated in this pamphlet were middle-of-the-road and rational. They might have been a little broad and theoretical rather than detailed and specific but they certainly represented legitimate positions. The decision of Joseph Smith to run for president was met with range of reactions. Faithful members of the church celebrated him for his courage, some even suggesting that this was the beginning of the establishment of Zion, the political kingdom of God, so long fabled in Mormon doctrine. Many anti-Mormons denounced it as evidence either of Smith’s egomania or his radicalism, or both, in trying to establish a theocratic state. There were other responses in between these, most of them negative. Of course, Smith did not live to complete his campaign for president. He was assassinated on June 27, 1844, by a group of conspirators while being held for trial in the Carthage Jail in Illinois. Joseph Smith believed he could be elected president. After all, the quest for Zion was very much a part of the church’s belief system and this might be the method by which the Saints would help usher in the Kingdom of God on Earth. And God, all powerful, could make such a long shot candidate successful if He chose to do so. Joseph Smith recognized that he could not be elected but wanted to make a statement about positions and principles. Were this the case he would neither be the first nor the last candidate to get into a presidential race to accomplish that goal. Joseph Smith recognized that he could not be elected but wanted to remove the Mormons as a voting block from the election. There had been a series of scandals and other difficulties associated with Mormon involvement in politics in Illinois throughout the early 1840s, and by declaring his candidacy he knew that the members would vote for him and therefore remove the church from the political games that might have been played otherwise. Joseph Smith was never really serious about running for president, but did so at the behest of others. The behest of others might be senior officials in the church, Illinois politicos, or someone else. There is very little evidence to support this thesis. Joseph Smith was not serious about running for president but wanted to use it as a platform for advancing another agenda. The agenda could be anything from publicizing his religious cause to gaining advantage in other arenas. Again, he would be neither the first nor the last candidate who really was not serious but realized fame and fortune through the process of candidacy. Joseph Smith was a megalomaniac who had lost touch with reality and had delusions of grandeur who believed he was the perfect candidate for president of the United States. There may be other possible explanations for Smith’s decision. What do you think? Nauvoo, Illinois, as seen across the Mississippi River from Iowa in the 1840s. So what does this have to do with Mitt Romney and to a lesser extent Jon Huntsman? Why is Romney so despised by the political right? By all accounts he is a mainstream Republican politician whose track record is just fine, his positions are generally acceptable to a majority of Americans, and his family life is exemplary. True, some criticize him for changing his mind on some issues, for working across the aisle, for expressing tolerance on, if not actually championing, social issues. Why is that not admirable rather than despicable? Fundamentally, this seems to go back to the Mormon church membership of both Romney and Huntsman. We saw this in 1968 with Romney’s father, George, who was condemned for his allegiance to what many people on the Christian right termed a cult. It seems that little has changed since 1968, or 1844. I’m curious what others think about the possibility of a Mormon president. Any concerns? This entry was posted in History, Mormonism, Politics, Religion, Reorganized Church of Jesus Christ of Latter Day Saints and tagged 1844 presidential election, Adam Christing, Carthage Jail, History, Jon Huntsman, Joseph Smith, Mitt Romney, Nauvoo, presidential power, public perceptions, public policy, Sidney Rigdon. Bookmark the permalink. Impish grin: First concern is, they’re Republican. But seriously, the Mormons I have known personally have all been good people. If I knew Romney or Huntsman personally, I would consider voting for them. The concerns I have with Mormonism are rooted more in my feminism, and more particularly related to the feminist critiques of the Twilight series (written by Mormon Stephenie Meyer). I have known women who want to marry a man who will take care of them. I’ve known women who want / like / actively choose to stay home and raise children. If/when that’s what the woman wants to do, I’d like to support them. That’s not what I want for my life. I agree with Ms. Curry’s first point, and I’m not grinning impishly, I’m enraged. The fact that they are Republicans trumps their religious affiliation. November 2000 is starting to look like a major alternate history divergence point for our country – what if Bush hadn’t been installed in the White House? Unfortunately, this is one we’re living through, not one taken from the history books. Does religious affiliation matter very much today? I’ve never paid attention to it much myself, and most people I hang out with don’t seem to care. If a candidate sacrificed babies to Baal I might be alarmed. In Gen. Joseph Smith’s pamphlet, he says on page 19, “My Father, who stood several times in the battles of the American Revolution, till his companions in arms, had been shot dead, at his feet, was forced from his home in Far West, Missouri,” However, his father, Joseph Smith Sr., was born in 1771. Did he really fight in the American Revolutionary War? It’s also interesting that Smith presents himself as a general, though his language is overwhelmingly religious, and he certainly sees history, politics, and his presidential ambitions in religious terms. To your question, did Joseph Smith believe he could win? Absolutely. He saw the divine hand in everything that he and the Mormons were doing. They were ushering in the millennium. If God could speak to an obscure boy and through him bring forward the Book of Mormon, restore the true church of Jesus Christ and all of its truths, ordinances, etc., send heavenly messengers to earth, and give his young prophet the power to translate ancient texts, heal, and inspire, why couldn’t God pave the way for him to become president of this Chosen Land. Joseph never doubted his divine mission nor lacked for confidence in carrying out that mission. Here we have the real reason for Romney running. It is not only the extension of fascist Amerika, which is what he espouses, but the religeous fundamentalism of the founder of Mormonism, Joseph Smith. That is the country of Zion. If anyone thinks that Romney does not think that he is God’s pick to complete the “Prophets” vision they are taking too many heavy drugs and are delusional. He believes this. In essence we could easily create another Iran run as a religeous fundamentalist country. We have seen this sentiment progressing for awhile. Study your history. This is not a crazy idea. This is basic fundamentalist philosophy both political and religeous which is always dangerous for the general population. Do not almost all religeons state that “I/We are the only way???? ?” What is the difference? This is antithetical to our present system of government which is being morphed into this other fundamentalist political and religeous state for the advantage of the elite and the indentured servitude of the general public. Smith was not assassinated. He was breaking out of jail with a gun brought in by a friend of the church and he shot his way out, killing 2 people and was shot and killed for his efforts. I really dislike the spin the church puts on their saint. He was a thief and a liar. Unfortunately, this is incorrect. Joseph Smith was not engaged in a “jailbreak” at the time of his assassination. He was awaiting trial. He had a pistol, which had been smuggled in, and while he fired it there were no deaths among those storming the jail. I suggest you read “Carthage Conspiracy” (University of Illinois Press, 1975), or a host of other studies of this subject including my article, “The Murders in Carthage: Non-Mormon Reports of the Assassination of the Smith Brothers,” John Whitmer Historical Association Journal 15 (1995): 17-34. You are about the only other person who seems to know about this. How is that? I’m certainly not the only person who knows this. I understand that. I meant you are the only one I have known who knows this. No one I talk with knows. It is rare for others to know is my point and that is a part of how they are getting away with this. Just as in Hillary’s run for president they made sure no one knew about the $160 million donated to the Bill Clinton Foundation by Guasti. Even though it was front page news one Friday in the Washington Post and N.Y. Times. When you look at the donations to the Clinton Foundation it also does not show. Power=deception. Art of War. Then I would say man is not only flawed but NO religion man creates, not even this one called LDS which I myself belong to, can save humanity. Because the greater evils of man eventually consumes us untill our final redemption of death.